Lose 5-15 inches in your first wrap! Our Aloe Vera Herbal Wrap Formula is one of our most popular body wrap formula’s sold. Aloe Vera has unique healing properties. It has been used for centuries to heal burns. Aloe Vera is used as a base ingredient of many new lotions and conditioners manufactured today. Ultimately it was introduced to the salon and spa market. Consumer publications has Aloe Vera listed as one of the top 10 most healthy products to condition the skin. Our Aloe Vera Herbal Detox wrap formula contains special herbs and seaweeds in their natural form. Herbs such as Comfrey Root, Eucalyptus, Irish Moss a seaweed, Japanese Green Tea, etc. for a cleansing and detoxifying body wrap experience. These are great for cellulite and inch loss. 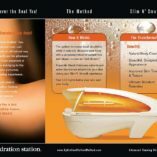 This special body wrap recipe is very popular in the most exclusive day spas and salons throughout the world. Try it today!